Actually this is my 2nd try in making the Japanese Cheesecake. 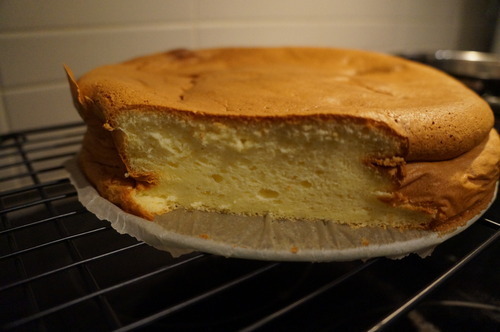 The first time I tried to make the Japanese Cheesecake, I used this recipe from the Cookbook Chronicles and failed miserably! The Cookbook Chronicles’ recipe doesn’t call for flour and I questioned it before giving the recipe a try… Let’s just say the cake came out soggy (and after spending hours on it, I was pissed!) and I did NOT take a picture of my failure..who records their failure anyway? Not me! But me being me, I don’t give up easily… So I went back online and looked for another recipe, one that made more sense, and one that explained each step a little better, and that’s when I came across this on The Little Teochew. This one helps a lot! I mean look at this! No Sogginess! Tip #1: Beating the egg whites! 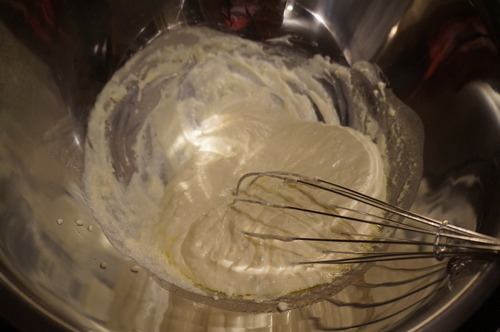 In a stand mixer…you beat the whites on HIGH and I whisked it for a good 5-10 minutes until they’re super high and stiff. Once you hit those white peaks, switch the mixer to low speed for 3-4 minutes. Lumpy right? Well I wasn’t going to screw this cake up and since they suggested sieving the mixture after you add the flour and yolks to the cream cheese mixture (seen above), I strained it using a mesh sieve. I just pushed and rubbed any clumps through with my rubber spatula. Remember to sieve before you fold the egg white mixture in though! 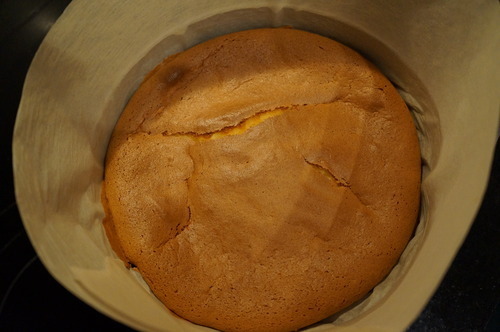 The first time I did the cake, I used a 9 inch cake pan, and placed the pan in a water bath (inside my roasting pan with about 1 cm of water up the outside of the pan.) I can’t risk having another soggy cake come out of the oven again, so this time around, I went with what the Little Teochew suggested, instead of using tart moulds though, I used little ramekins filled with water and stuck it on the rack below in the 4 corners of the oven. This provides less condensation, which means a smaller chance of my cake coming out soggy!